Once again I am most grateful to Stuart Wyss for this photo. Peter Greave’s recent comment on that handsome Rochdale Regent III and Chris Youhill’s mention of the Leyland 8.6-litre engine prompted me to send this English Electric-bodied Leyland TD7 of 1940, which I guess must have been Rochdale Corporation no 170. It had gone from Smith’s by 1964, and most probably by 1960. Another double decker that migrated south to spend its final years as a contract bus. If I find more info, I’ll put it up: even better, OBP friends may be able to shed more light. 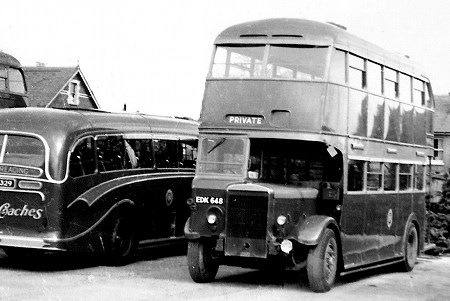 I was delighted to find this picture of a 1940 Rochdale TD7 with English Electric body. After my article on EEC bodies, I was hoping to see as many as possible of the 1937 re-design. There were far fewer EEC bodies built after this date, Southend, Bradford and Barrow being the only ones I could bring to mind, but there were others, including Rochdale. Any more? This delivery in 1940 must have been among the last genuine EEC bodies built, and it clearly illustrates the design difference from the pre-1937 style. Again, I wonder why it was not more successful. A lot of later English Electric bodies were to customer’s design, Manchester’s notably, as a lot of others were just one-offs. The bodies I can find photographs of built to the final style were for Ashton, Salford, Barrow, Rochdale and Glasgow (although the latter appears to have more than a bit of Weymann styling). In addition lowbridge bodies were built for Central SMT and Newcastle. Some operators seemed to stick with more traditional designs – as far as I can tell Preston did but there are only photographs of the interiors of the last batches. I really appreciate your info. re. EEC bodies, and will check out those you mention at Ashton, Salford and Glasgow. Southend’s were to lowbridge layout. Rochdale, Barrow, and Bradford I know about, I am aware of Preston building to operators own style, such as Manchester c.1940/1, but had no idea that SMT and Newcastle had lowbridge bodies by EEC. I now live in Sutton on Sea on the Lincolnshire coast following living in Reading for a period of 60years. 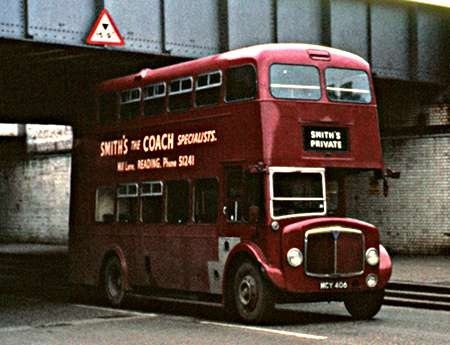 I remember Smith’s Coaches for the many journey’s I was able to enjoy. I can remember that on a Saturday morning the Coaches would all be ready to travel being parked in Mill Lane and all up Southampton street to destinations all along the South coast. Smith’s did a great service to all those people who wished either to journey for a week’s holiday, or for a good day out. of recent I have stayed at the Premier Inn now situated at what was Mill Lane in Reading , so it does bring back very fond memories. Smiths of Reading purchased EDK 645/6/7/8/9 (RCT 167/8/9/70/1) with EE bodies and EDK 650/2/3 (RCT 172/4/5) with ECW bodies via W. North. They arrived at Smiths between July and September 1956 and departed during 1959 and 1960. Recently I had a long and fascinating talk with Jim Foster, a Smith’s driver from 1962 till 1973. We went through some of my photos (taken by Graham Low and Stuart Wyss) and some of Jim’s own, and watched a black and white film of drivers building the Rose Kiln Lane garage after the war, with commentary by Mrs Jackie Mills, the Guv’nor’s daughter. Also in the film are stills of Dennises and Bedfords lined up in Mill Lane ready to leave with excursion passengers bound for Southsea and who knows where else. 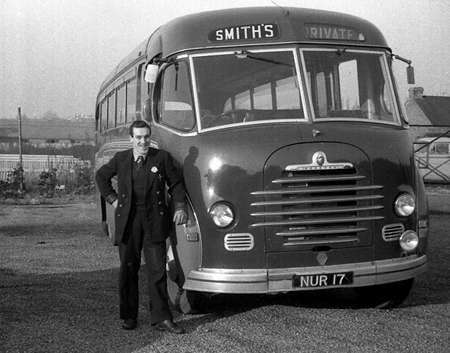 Jim mentioned that Smiths themselves built some bodies, but I wonder whether they were extensive rebuilds of some of the bodies that came off the prewar Leyland Cheetahs. The nice straight waistrail and window spacing are clues. Apologies to Doug Adams—I didn’t reply to his January comment—but John Whitehead and I continue to glean morsels of Smith’s history. More when available. Just found the Smiths website. 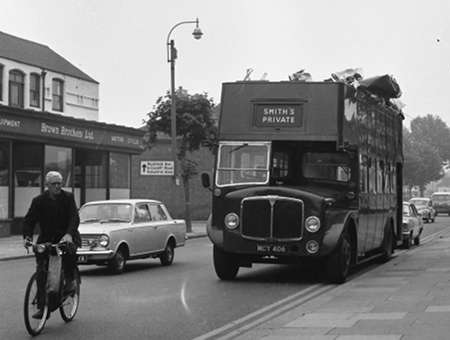 I have pictures no one has seen, taken when I worked at Smiths in the 1962 era., and I plan to put them out for every one to share some time. I was known as the man with the camera. I then went on Horsemans a few times, and HGV driving also became a Driving Instructor with Beeline and HGV instructor as well, as they say watch this space. We’ll look forward to seeing your photos, Dave. Looking forward very much to seeing Dave Doe’s photos. If I remember right, Dave used to keep a camera just behind the windscreen of his coach and never missed a good shot. Welcome to the fold! I am sorry about delay in sending any pictures of Smiths Coaches promised in 2013, but I lost the email. I am enclosing a couple of pictures from my vast library of employment pictures. My collection consists of numerous staff pictures and vehicles and unusual pictures never seen before. I enjoyed my time at Smiths, with many laughs and incidents. I will try and send others. Here is a picture of MCY 406 before it entered into its argument with the bridge. Dave: Good to see your photos of those two Smith’s vehicles. Looking forward to seeing plenty more when you can dig them out, and to hearing a few anecdotes too! Roger: Thanks for the pre-decapitation picture of MCY 406. Confession: although I’m usually sorry to see any vehicle come to grief, I never had any affection for those Regent Vs; they seemed inferior to the ex-Leeds PD1s, the ex-Oxford and ex-Rhondda Regent IIIs, the ex-London RTs, the Lancet IIIs and the quaint collection of heavy single-deck chassis bearing rebuilt Alexander bodywork from Leyland Cheetahs. Ian, my sole driving experiences with Regent Vs took place with the Halifax examples, and it would be an understatement to say that I was unimpressed. How AEC, having made the highly civilised Regent III, could then substitute it with so uncouth a beast as the Regent V baffles me to this day. I’ve sometimes suspected that the crash gearbox versions of the Regent III were just as rough and raucous as the synchromesh V, though your comment suggests that this was not the case. I suppose that the Monocontrol Vs were smoother and quieter runners than the synchromesh ones. Perhaps someone could confirm. Hi I worked in the body shop 1968 to 1978. I actually built a new roof for that double decker with Les Cooper. Does Barry Armstrong have any info. on how much rebuilding was found to be required on the early RTs bought by Smiths in the late ’50s. There’s a picture of one (FXT 283),taken in 1963,that appears to have had its upper-deck windows replaced. I’ve just seen Roger Cox’s query from 18/11/15 – 07:25 about AEC Regent Vs. The early D2RA version, with A218 engine and Monocontrol transmission, was every bit as civilised as a Regent III, if not more so in some cases, at least from a passenger point of view. 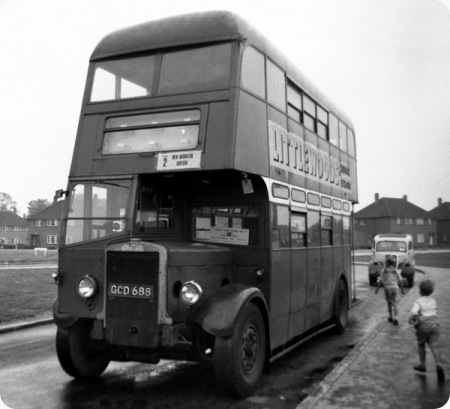 The later 2D2RA, with AV590 engine, sounded more like a Routemaster being driven in semi-automatic mode. This shot is from the Roger Cox gallery contribution titled "The People’s League for the Defence of Freedom" click on the title if you would like to view his Gallery and comments. 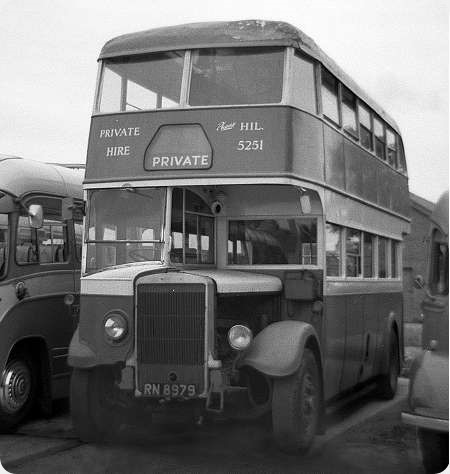 This bus was built for Southdown as No 288 with a Park Royal body part of a batch numbered 266-292 in 1940 but due to travel restrictions on the south coast they were deemed surplus to requirements and diverted to other companies, Crosville receiving 16 the others went to Western Welsh 7 and Cumberland 4, none ever ran for Southdown. The fleet numbers were used after the war the first of their Leyland PD1’s.